Donald Trump Supporters are Calling to #Repealthe19th? 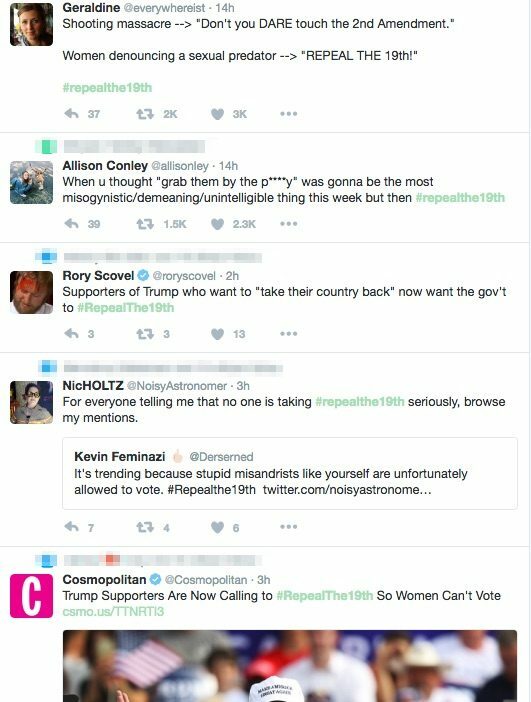 After Nate Silver tweeted two gender-based electoral maps demonstrating Trump would win if only men voted, #Repealthe19th became the call to action that wasn't. Supporters are using the hashtag #RepealThe19th in response to Nate Silver of FiveThirtyEight’s recent findings that Donald Trump would win this November’s election by a large margin if only the country’s men voted — and that Hillary Clinton would win by an enormous margin if only women voted. A call to repeal the 19th Amendment represents a highly misogynistic viewpoint that is extremely damaging to women’s rights and empowerment. While it is probably safe to say that most people, including most Trump supporters, do not believe in abolishing a woman’s right to vote in the United States, social media has given a provided a platform that inadvertently helps to almost normalize such an extreme viewpoint by making it a part of our rhetoric. BuzzFeed‘s “Trump Fans Are Now Saying They Want to Stop Women from Voting With #RepealThe19th” similarly treated the hashtag seriously, as did Salon. 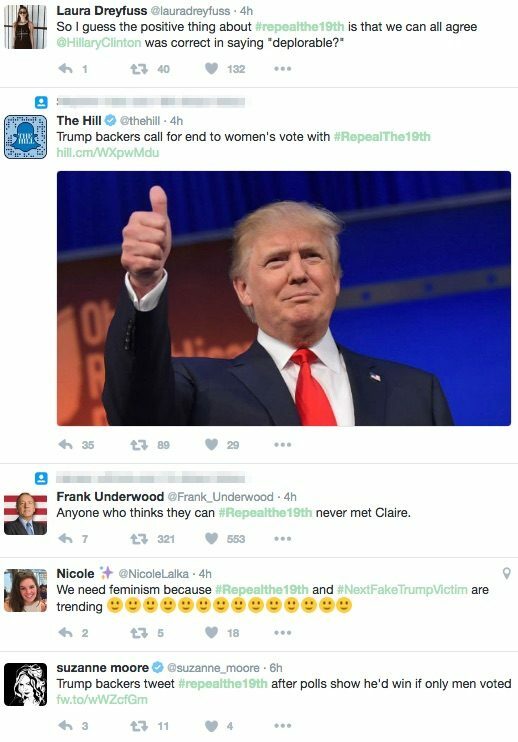 But even as blogs and news sites reiterated the claim that Trump’s supporters were seeking an impossible rapid-fire repeal of the 19th Amendment (presumably before 8 November 2016), their coverage contradictorily consisted only of tweets opposing the hashtag. Over and again, the same three tweets were used to evidence the existence of a legitimate movement to take back women’s right to vote, along with coverage of the backlash against the nontroversy. After Silver tweeted the two election maps, it was likely enough Trump supporters joked about repealing the 19th Amendment to create a Twitter trend. But despite numerous media outlets reporting #Repealthe19th as a genuine call to strike the amendment, there didn’t appear to be anyone seriously suggesting women’s right to vote be rescinded in order to facilitate a Trump win.